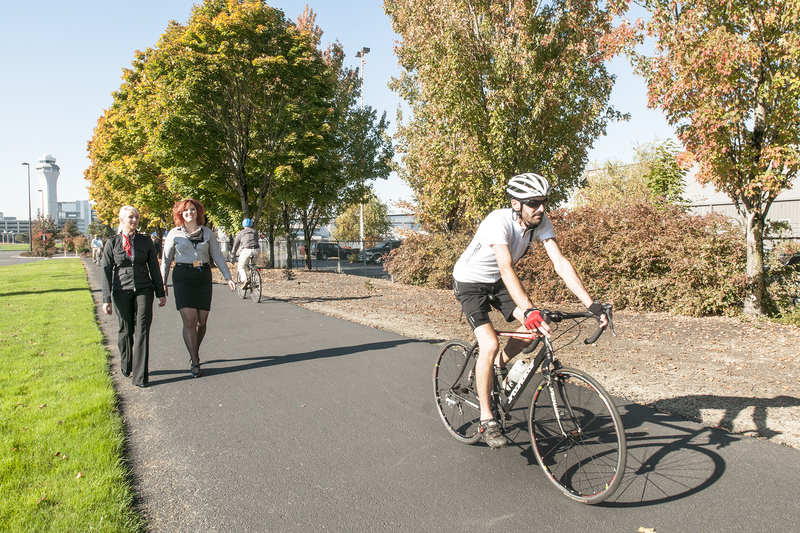 The Port of Portland recently completed an update to its PDX Bike and Pedestrian Master Plan. Planning for pedal and foot-powered transportation might initially seem like an odd fit for a facility that is primarily focused on flying travelers to far flung destinations. In a community that boasts about its bike lanes and neighborhood walk scores, it is all about providing good customer service and reflecting the needs of the large workforce that keeps PDX running on a daily basis. The PDX Bike and Pedestrian Master Plan is not a regulatory requirement. 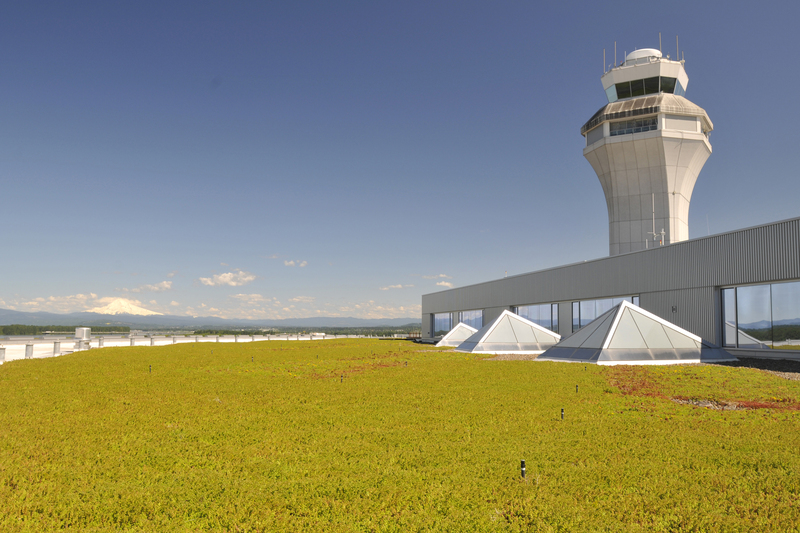 Providing alternative transportation options to and from PDX helps the Port meet its sustainability and employee wellness goals in addition to meeting the needs of travelers and airport employees. The Port began planning to accomodate cyclists and pedestrians in the 1990s. By 2003, the Port became the first commercial airport in the nation to develop a comprehensive bike and pedestrian master plan. 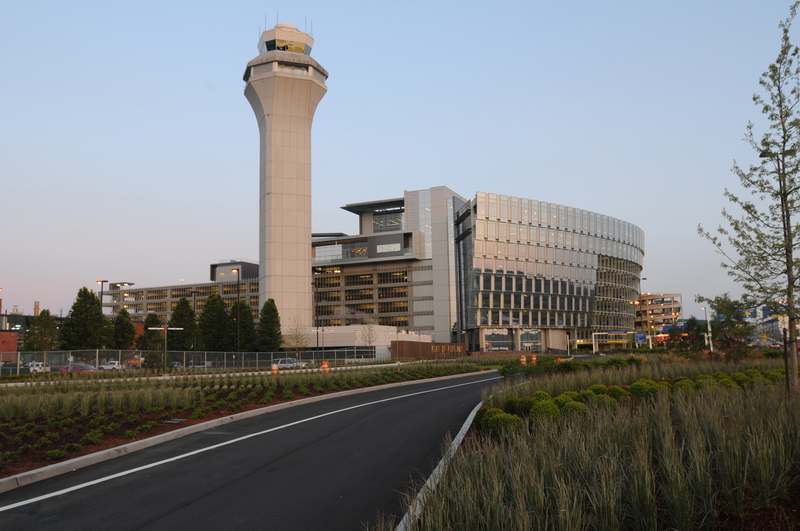 In the last decade, implementation of that plan led to constructing a multi-use path directly to the PDX terminal building – another first for a commercial airport – and secure bike parking for airport employees and public bike parking for travelers and visitors. Beyond the terminal, an at-grade bike and pedestrian crossing of Airport Way at its intersection with NE 82nd Avenue, which is considered one of the most complex intersections in the state, provides a connection to the multi-use path from points south. It also allows pedestrians to access businesses on Frontage Road after taking TriMet MAX light rail to stops in nearby Cascade Station. Cyclists originating from points north along the Marine Drive Bike Path or crossing the Glenn Jackson Bridge benefit from a quicker option for accessing PDX by using a designated crossing constructed by the Port that connects directly to the multi-use path. With many of the goals from the 2003 Master Plan achieved, the Port began updating the plan last year. After a thorough analysis and outreach to bike and pedestrian facility users and experts, the new plan includes recommendations to support and improve the airport’s cycling and walking populations as well as identifying challenging connections between PDX’s bike network and bike networks to the south. One of those challenging connections, the intersection of Columbia Boulevard and NE Alderwood Road, will soon be converted to a signalized crossing, improving safety for cyclists. The Port will contribute to funding a portion of the improvement thanks to a recent State Transportation Improvement Program award. Currently, many of the public bike parking areas at PDX are frequently near or at capacity, even during cold and rainy winter months. The Port plans to replace the existing serpentine racks with staple racks to add parking capacity within the next year. The Port will explore additional signage and work to incorporate helpful information for pedestrians and cyclists as broader wayfinding technology advances at PDX. In the longer-term, the Port will seek to develop an outbound multi-use path in conjunction with future improvements to the PDX terminal and terminal exit roadway. The updated Bike and Pedestrian Master Plan can be found on the Port’s public website and cyclists can find information on accessing PDX by bike there as well.